The Philippines is known to its amazing underwater destinations in the world, with more than seven thousands gorgeous islands. From spectacular reefs and crystal clear water of the Pacific, no doubt that the Philippines is one of the best diving spots you're looking for. Recently, the famous French freediver Huillaume Nery is showcasing three Philippine dive sites in a 12-minute video - featuring a breathtaking underwater scene beneath the ocean deep. The short clip 'One Breath Around the World' was released on February 2 on Facebook and earned 1.6 million views and 39,000 shares. 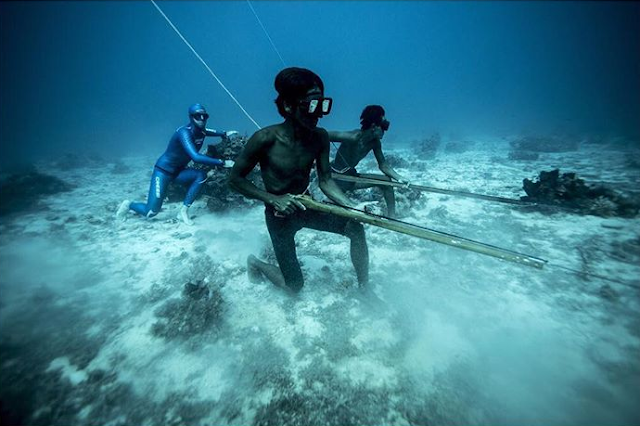 The video showed a stunning limestone formations under the Barracuda Lake in Coron, Palawan and Davao del Norte's Sama-Bajau people, hunting sea creatures in a deep water of 200 ft were they could stay underwater for as long as 13 minutes without using oxygen. The couple started filming the world's best underwater freediving shots in April 2017, along with his wife/videographer Julie Gautier and photographer Frank Seguin. They already been to film Cenote Angelita in Yucatan, Mexico, frozen Sonnanen Lake in Finland and Yonaguni Monument off the coast of Japan.